In the previous note we looked at the approach taken by the standard to the sizing of cables and illustrated this with an example. We then looked at one method of applying the standard and identified resources enabling the calculation of all the various parameters involved. In the note we are going to put everything together and reveal the necessary equations for actually calculating the cable maximum current rating. The image illustrates the thermal model for a cable. 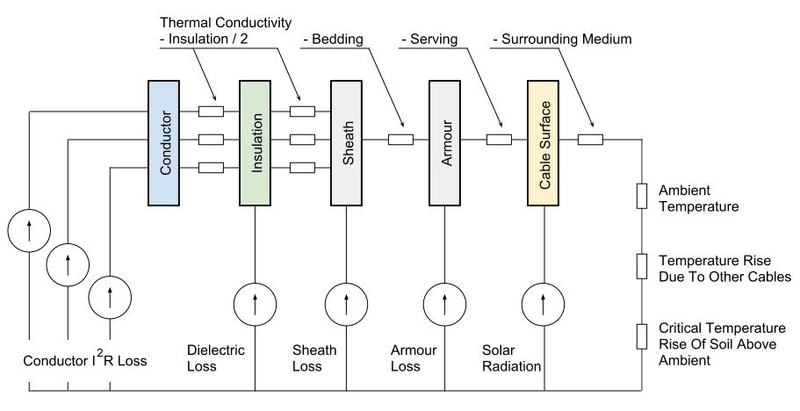 Heat is generated within the cable by various mechanisms - conductor I2R loss, dielectric loss, sheath loss, armour loss and direct solar radiation. Some or all of this heat is dissipated through the cable insulation, bedding, serving and into the surrounding medium. The rate of heat flow is related to the temperature difference across the cable and affected by the ambient temperature, temperature rises due to other cables and any critical temperature rise of the soil above ambient. In thermal equilibrium, when all these factors have balanced and the temperature of the conductor is the maximum allowable for the insulation; we have the maximum rated current for the cable. It can probably be appreciated by now, that in typical real life situations, this can be quite a complicated calculation. Note: rated current capacity found by the method assumes that the cable is fully loaded for 100% of it's operation time. For cables which have varying or cyclic loads, the current rating could possibly be increased. Tip: the thermal model is worth remembering as enables us to intuitively understand how a cable is likely to behave in conditions which are not normally encountered. For example, if a cable is run along a refrigerated gas pipe, we can hazard that this will reduce the ΔΘ and hence the cable will be able to carry more current. Within the standard this above is used to derive the equations for current rating. It is simplified for d.c. cables by eliminating any a.c. only effects and modified for partial drying of soil and solar radiation where appropriate. Note: when calculating a cable where some drying of the soil may occur, it is also necessary to perform the calculation for no drying out of soil and take the worse case (lower) rating. The calculation of each element needs some explanation and these have been split across several notes (with each note dealing with one topic). For details, please refer to the first note in this series, which lists the other related notes. I dont know how i can thank you for the great information's you provide,and its really appreciated..
once more thank you very much and keep on. Just to notify you, but correct me if I'm wrong. I need to use your calculation but there is a mistake with the factorisation of the denominator in the formula for buried cables where drying-out of the soil occur for AC cable. (It looks logical, otherwise we would have been a squared resistance in the denominator). Thanks for the feedback. I've modified the drying out equations slightly. Let me know if you have still think something is wrong. Just another thing I've just noticed (still easy to figure out because of unexpected results) in the section "Buried cables where drying-out of the soil is to be avoided", AC part, in the numerator, it should be a subtraction instead of an addition. To let a positive comment, I find your website very helpful. Thank you. Paul, please feel free to keep pointing out problems. Feedback is one way I can improve the articles. For anyone referring to BS IEC 60287:2006, please be aware that the formula given for AC cables where drying out of soil is to be avoided, contains the above error. IEC 60287, itself does have the correct equation. This formulas really helpful, but my question is what is the limit of overcurrent carrying capacity of cable? Arjijit, I'm not to sure exactly what you are asking. The equations give a safe steady state rated current for a cable. If you exceed this value of current, you could be affecting the life of the cable. The more you exceed the greater the effect. My view is that you should used the equations to select the cable based on your anticipated current rating. You then select an approppropriate protective device to isolated the cable should you exceed this value. If you have a load current which is genuinely varying, you could use IEC 60853 "Calculation of the cyclic and emergency current rating of cables. 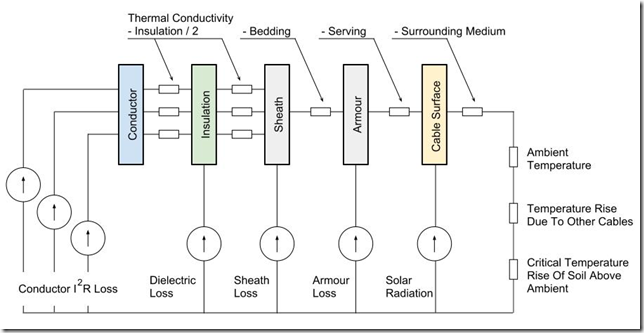 Part 1: Cyclic rating factor for cables up to and including 18/30(36) kV". Why is electricity so hard to understand? If you have some expert knowledge or experience, why not consider sharing this with our community. By writing an electrical note, you will be educating our users and at the same time promoting your expertise within the engineering community. To get started and understand our policy, you can read our How to Write an Electrical Note.